Rebecca Styn casts her trained eye on bayfront development, Operation Safe Travel, and the city's budget. Not that long ago, the Erie-Western Pennsylvania Port Authority started a master plan to develop the Erie waterfront. In hopes of reviving part of this project, the Port is now looking to move forward with McAllister Place, a mixed-use project that would bring 17 condominiums or apartments, 42,000 square-feet of office space, 15,000 square-feet of retail space, and 205 indoor parking spaces to the area. With this plan, the current McAllister tenants – Anchor Marine, the Bayfront Gallery, and SRG Photography – would have to relocate into the new McAllister Place or somewhere else. And with this plan, the current structure would be entirely demolished – losing one of the last remaining historic buildings on the waterfront. "I remember when this was proposed several years ago," said City Councilman David Brennan. "I knew it was on the table, but I didn't realize it was getting this serious." The project will clear the rest of East Dobbins Landing and make a pathway for this building. "Many people don't realize, but this is one of the last remaining buildings there on that side of the waterfront that carries any historical significance," he said. "I think when they find a developer, they should find a way to incorporate the existing front into the building. It is very unique, and it would mean a great deal to our community to keep some of that history – and more importantly, a link to our past." The building was developed back in 1930. According to the National Register of Historic Places, a building has to be at least 50 years old to qualify as historic. However, this building is not currently in any local databases for historic preservation. "Admittedly, the exterior of the building does need work, but it can be restored," Brennan said. "The structure is sound, and there's no reason not to keep the exterior – that's the main focus. It's steel-framed and there's mainly cracking in the veneer; the significance is that it is really the last building remaining. But the economics have to work." 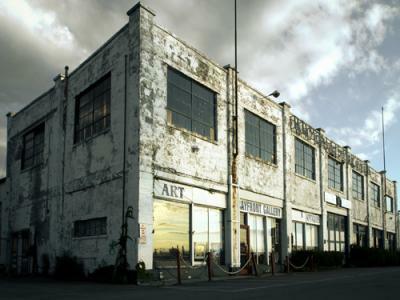 The Port Authority owns this building, so its fate ultimately rests in the Port's hands. "I just think we need to push the issue a bit and at the very least consider it," Brennan said, because as he sees it, the building's set to be demolished in all the drawings and renderings he's reviewed. "Erie continues to try to remove our past. What we have to do is try to save some of our historic structures and re-use them. In the '60s and '70s, we removed so many great buildings. Oftentimes I often look at the book 'Lost Erie' and see so many buildings that were removed, and mediocre buildings – not of the same caliber – developed in their place." Cities such as Duluth, Minnesota and Philadelphia, with their Navy Yards, have capitalized on the idea of revitalizing structures that have held historical significance to their respective cities. Our way of thinking needs to change a bit, and we need to start creating industry all the while maintaining a continual link to our revered historical past. According to the Pennsylvania Department of Transportation, last year there were 1,994 crashes and 19 fatalities between Christmas and New Year's Day. Because of this, "Operation Safe Travel" will be in full effect by the time you are reading these words. What does all of this mean to you? Police will be watching for impaired and aggressive drivers and will be stepping up their sobriety checkpoints through the end of the year, which is a great thing for Erie - so, play it safe folks. We don't want you amongst the statistics we've just presented. Erie Mayor Joseph Sinnott presented a budget for the city of Erie Wednesday, Nov. 14 that once again does not raise property taxes or fees, but includes additional money for police overtime to help fight crime on our streets. In his words, "It's a balanced budget that reflects the true costs of providing safety and services to our citizens." And who can't appreciate that?! Love? Hate? Agree? Disagree? I want to hear from you. Email me at rStyn@ErieReader.com and follow me on Twitter at @rStyn.